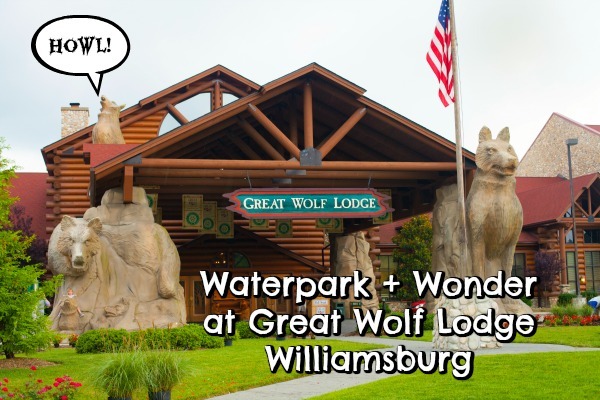 Curious about Great Wolf Lodge in Williamsburg? 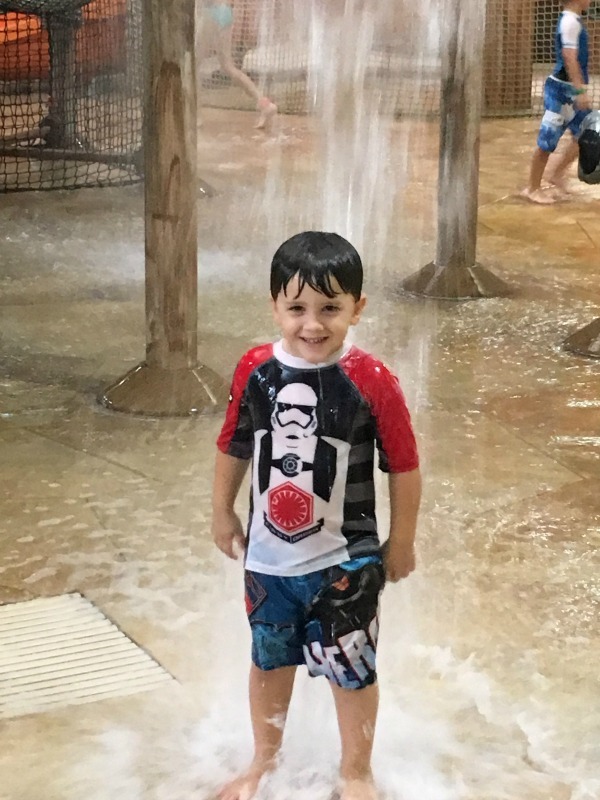 A Parent in Silver Spring writer Guiomar Barbi Ochoa experienced the resort with her family and has the scoop for us. Wolves and I are not great friends. I’m a child of the ’80’s, and I distinctly remember a fiasco where my teenage aunts were babysitting a pack of us and they thought it would be a stellar idea to pop An American Werewolf in London in the VCR. The movie terrified me and I swore off wolves forever. 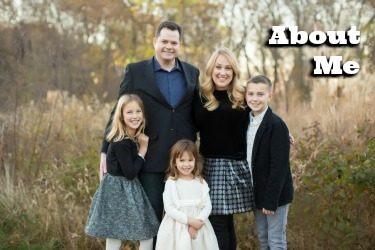 That was until my kids saw a commercial for Great Wolf Lodge and begged us to take them. I figured this place would be tamer than the movie so we gave it a shot and boy, am I glad we did! 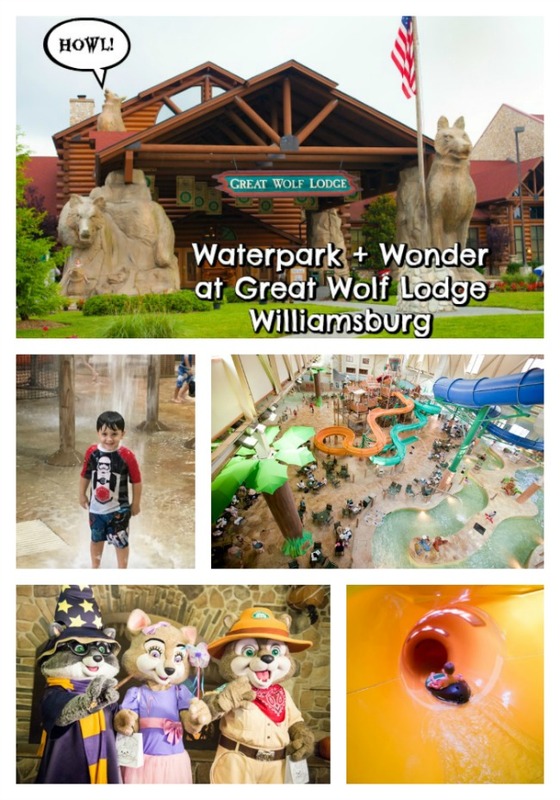 We went to Great Wolf Lodge Williamsburg which is a relatively short drive (2.5 hours) from D.C. We knew we had a fun-filled weekend ahead of thanks to their Howl-O-Ween activities. I was a little nervous as my oldest, Anna-Cecilia (6) inherited my intolerance for anything scary, but I have to say GWL does a great job of decorating the Grand Lobby spookily without making it too daunting for kids. 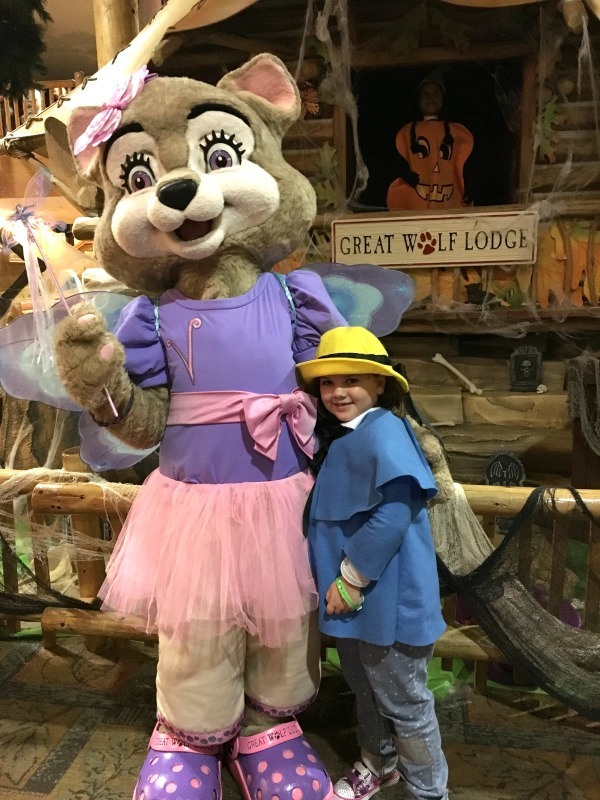 The Trick or Treat Trail began at 6pm, and the kids were delighted to collect candy throughout the resort from staff members decked out in costume. We spent the remainder of the evening experiencing awesome Halloween activities like Spooktacular Story Time, a Costume Parade and even a Monster Bash Dance Party in which kids are encouraged to wear their PJ’s, a seasonal take on GWL’s celebrated PJ parties. It was all super fun! 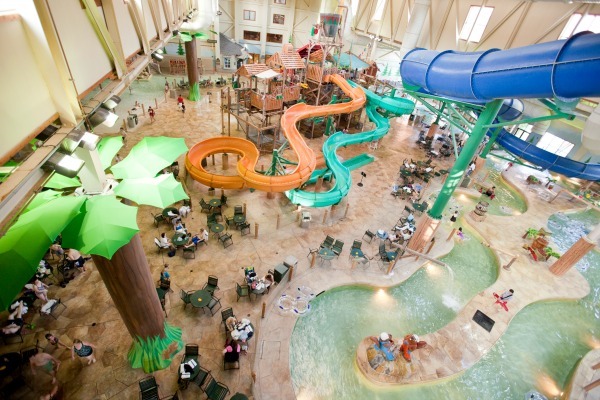 For sure, the highlight of GWL is the amazing 80,000 square foot indoor water park! It’s a parent’s dream in that it’s very contained and they have incredibly diligent lifeguards monitoring every angle of the place. They also have plenty of life vests, for all sizes, for your family to borrow. 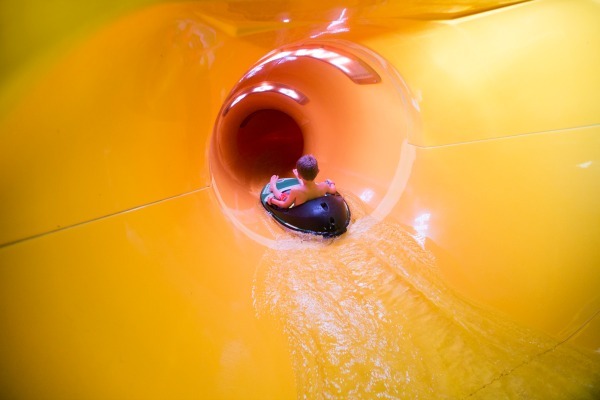 The water park has lots of options for varying ages which is fantastic. We started off serenely at the Slap Tail Pond and slowly graduated to more adventurous undertakings like Fort Mackenzie and the Totem Towers. Without fail, the funnest and most terrifying for us was Alberta Falls. We all survived but I almost hurled between the strobe lights, heavy metal music and powerful twists. The rest of my crew wanted to ride it again but I graciously passed.We spent four hours in the water park and had a great time. Scattered throughout the lodge is MagiQuest, a scavenger hunt which electronically saves children’s accomplishments with a tracked score. I think this is definitely and smartly geared towards tween and teen visitors but my littles (ages 6 and 3) liked it nonetheless. 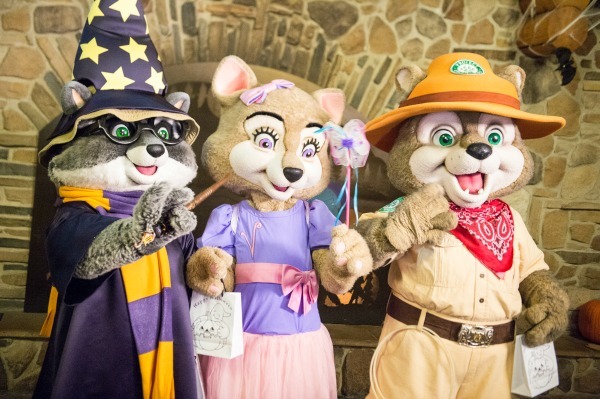 They both got wands that were activated and worked on objects throughout the resort like treasure chests that magically opened and fairy houses that lit up. If you need a little down time, the Cub Club is a craft and activity center and a really nice way to unwind from the rest of the madness. It’s also conveniently close to the Creation Station where your kid’s favorite Great Wolf character goes from floppy to stuffed à la Build-A-Bear workshop. The sweet GWL attendant helping us let the kids stuff their wolves and they loved picking out their outfits! We wound the night down with a visit to the Northern Lights Arcade. This place is sensory overload and can be dangerous for kids who want to rack up 1,000 tickets so they can get a Shopkins pillow. I set a thirty minute limit to the time we spent there but we all loved it including my husband who was madly trying to punch rubber duckies down in one game. Don’t say I didn’t warn you! A great aspect of GWL for families is definitely their suites. A family suite is standard and you’ll find plenty of room to move and relax with two queen-size beds and a full-size sofa sleeper. If you really want to knock their socks off, book one of the themed suites for the family. KidKamp, Wolf Den and KidCabin suites offer memorable additions like bunk beds, colorful murals and even balconies. Premium suites are also available with multiple rooms and even a fireplace! There was lots more to see that we didn’t get too but there’s always a next time. 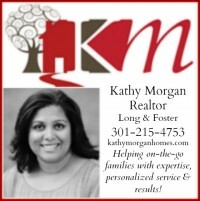 We saw plenty of family reunions happening at GWL, and we agreed that the site was perfect for that. All ages can hang out together and find something to entertain all stages of kids. We give GWL two thumbs up and a mega HOWL! 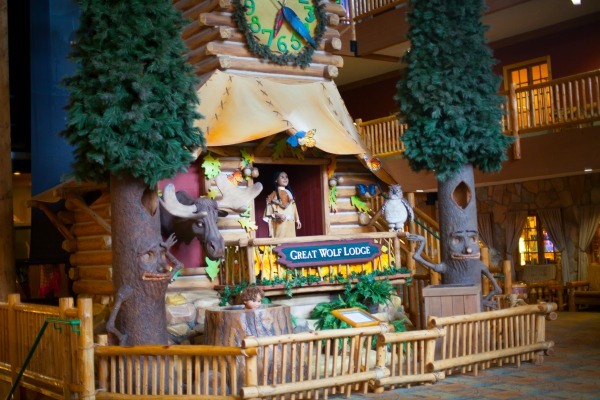 Guiomar and her family were hosted at Great Wolf Lodge Williamsburg for an overnight press experience. All opinions are her own.